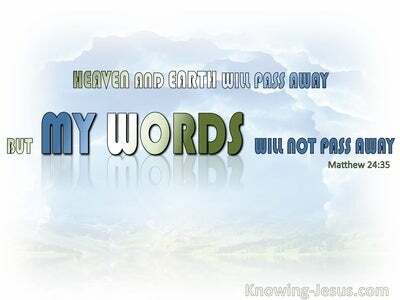 What Does 1 John 2:11 Mean? All of Scripture, should be read in context, and this letter from John’s was written to fellow believers. The Apostle is laying out the basic principles of fellowship, within the Body of Christ, during times of increasing deception in the wider world, where the love of many has grown cold, and Christians are instructed to act as lights in a world, darkened by a web of deceit and duplicity. 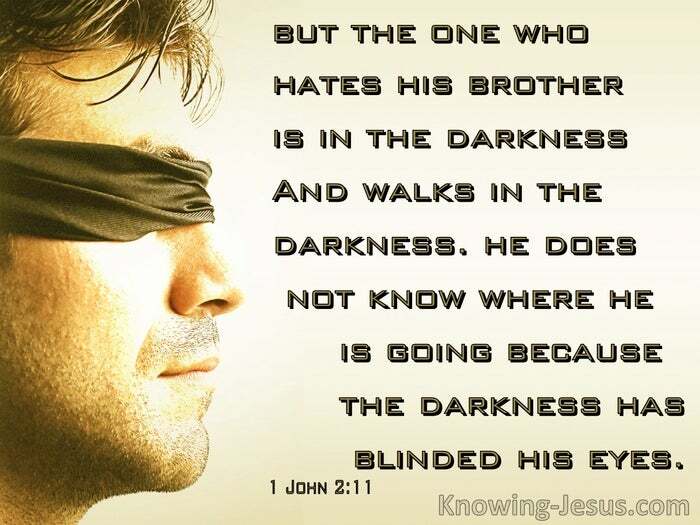 The ‘one’ in this verse is a believer, and John states that, the one who hates his brother is in the darkness, and walks in the darkness. The one who hates his brother does not know where he is going, because the darkness, caused by his hatred, has blinded his eyes. This is indeed a strong condemnation of the ‘one’ who hates his brother, for the ‘one’ who hates his brother is in darkness and walks in darkness. He has lost his spiritual sight, because the darkness of hatred, has blinded his spiritual eyes. This serious state of affairs does not refer to the condition of an unbeliever, prior to their salvation, but to a Christian, after having been born of the Spirit. Earlier in the epistle, John explained that the believer who sins, must confess his sin to God the Father… and the Lord Jesus will act as our heavenly Advocate, so that our sins may be forgiven, and fellowship with the Father may be restored. Hatred is a sin, and every sin we commit causes the believer’s fellowship with the Father to be broken – until our sin is confessed to Him. John explained earlier that IF we confess our sins He is faithful and just to forgive us our sins, and cleanse us from all unrighteousness – which will return us back into fellowship with Him. John also reiterates the command that Christ gave His followers, just before His death.. Love as I have love. However this godly love is only possible, as we abide in Him, so that His abiding love in our hearts, is enabled to flow back to our heavenly Father, in thanksgiving and praise.. and out to others, as a healing stream of living refreshment. When hatred towards another believer is excited in the heart of a fellow Christian, it is a hindrance to spiritual fellowship and an obstacle to godly growth. Resentment against a brother, that is harboured in the heart, has a disastrous effect on the believer. 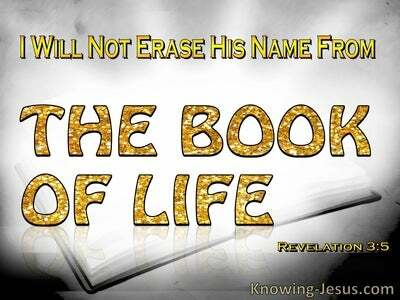 It extinguishes the inner light of Christ’s love and grieves the indwelling Spirit of God. Hatred towards a brother is so detrimental to the believer, that it causes him to stumble around, like a blinded man, who is encased in thick darkness. Christians who harbour hatred in their heart, for other believers, are seriously impaired in their Christian walk. This serious state of affairs is not just limited to those that outwardly detest or criticise other Christians, but those who put on a show of Christian piety and civility, while nursing a heart that is blackened by hatred towards their brethren – which equates to murder, in the eyes of the Lord. 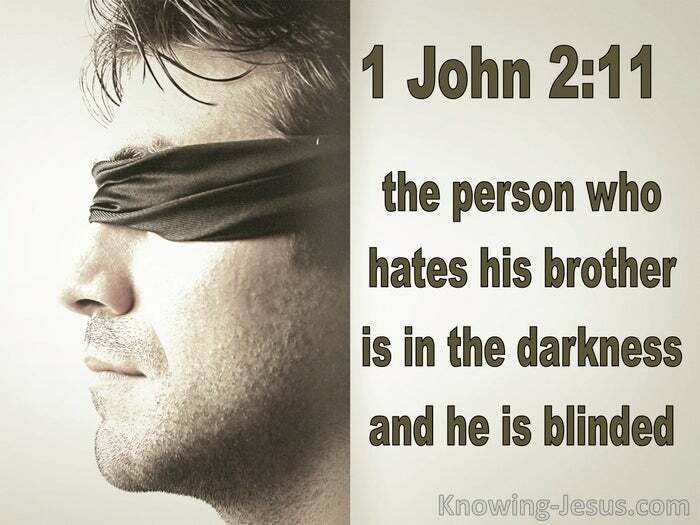 What a shocking state of affairs, that believers can be so filled with dislike for another child of God, that they are described as being in darkness; walking in the darkness and not knowing where they are going, because their hatred had caused this darkness, which has blinded their eyes. The direct contrast between light and darkness, love and hatred in this passage is staggering, when we realise that this is referring to a Christian – for although saved by grace through faith… their life and witness is being wasted away in their cancerous attitude. Christians are ambassadors of Christ in this world, and everything that we say and do reflects positively or negatively on the Lord Jesus, Himself. 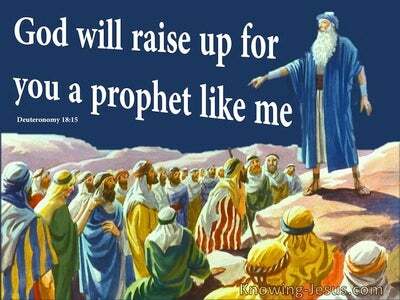 We are exhorted to let this mind be in you that was in Christ Jesus our Lord. A mind of goodness, grace and forgiveness. A mind that loves others as Christ loved us. In His strength and sufficient grace we are instructed to develop a mind that is patient and kind. A heart that is neither jealous nor arrogant. A life that is not unbecoming, nor easily provoked.. and a life that does not take into account any wrongs they have suffered. We are commanded to put on a Christlike mind that does not rejoice in unrighteousness, but rejoices in the truth – by bearing all things, believing all things, hoping all things and enduring all things. May we be kept from the dark blindness of hatred, by developing the mind of Christ – for we have the treasure of the indwelling Spirit of Christ within our earthen bodies, so that the surpassing greatness of His power within, will be of God and not from ourselves.